There are certain things in life that don’t mix, like oil and water, or humidity and hair. Add to that balloons and power lines. Someone who lost their grip on a handful of Mylar balloons set off a chain of events that ultimately left nearly 2,400 customers in the Stone Oak area without power on Aug. 3. But our crews didn’t know that when they started searching for the cause shortly after the first outage happened around 3:30 that afternoon. Staff back in our Energy Management Center tried to restore the outage remotely, but that’s where another thing that doesn’t mix well with power lines – dirt – came into play. Dirt had built up on a piece of equipment preventing a remote restoration. Crews were sent out to fix the problem, but as they worked, other customers were losing power. The outages were shorter for some and longer for others, but it took three hours to completely resolve the problem. 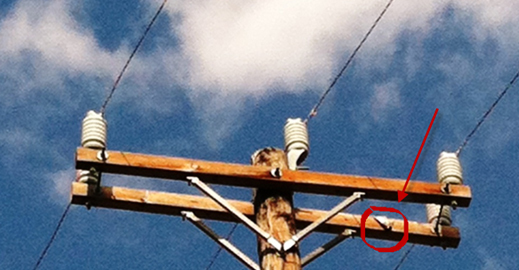 Because we always want to understand what went wrong in an outage, our engineering group checked the scene the next day and found pieces of balloons on the ground and on the crossarm of a pole. 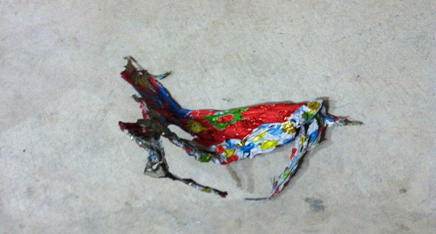 This mangled Mylar balloon got caught in a crossarm and caused a major power outage. A witness confirmed their suspicions, saying she saw the balloons and sparks flying near Hardy Oak and Stone Oak Parkway at the time of the outage. Kids, and kids at heart, often love to see balloons drift into the sky to see how far up and away they will go. But the results aren’t nearly as adventurous as Pixar movies. Like environmentalists, we here at CPS Energy cringe when we see balloons going skyward. Balloons caused at least 30 local outages last year, which affected a minimum of 12,000 customers. Part of the balloon still stuck up in the crossarm. It’s a costly problem that affects power service nationwide. Mylar balloons, the shiny foil looking ones that are made with material that helps conduct electricity, are the worst. California went so far as to try to ban the sale of them but instead put strict rules into place that would regulate sales in the hopes of reducing the number that would end up fouling power lines. In a 2007 study, three utilities there cited a $120 million cost to businesses from ballooon outages, plus the utilities’ costs to repair the outages. So, if you’re planning to celebrate the first day of school, a birthday, Valentine’s Day, or any other special event, please don’t let the balloons float away. Your moment of celebration could darken someone else’s day.